Hon. Imoudu Sule, father of the controversial preacher, the apostle Johnson Suleiman, has publicly warned his son to stop criticizing President Muhammadu Buhari. Sule, who is the current leader of the Congress of All Progressives (APC) in Auchi, as well as the APC deputy leader Etsako West, Edo State, Nigeria, told the ardent cleric to "leave politics for politicians" . He said this while talking to select journalists in Lagos. "This is a man that I love, respect and have in high esteem for being a whole person over the years. "Every time I hear people criticize my group, the (APC), my heart bleeds." 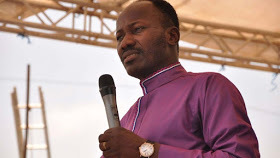 Apostle Johnson Suleiman, who is my biological son and a renowned gospel preacher, has lately become a constant critic of the ruling party. .
"And I am seriously worried because numerous supporters are now urging me to call my son to order. "I hereby make my voice heard so that Nigerians know that I have warned my son (the Apostle Johnson Suleiman) to immediately leave politics to the politicians and focus on his calling as a priest. "Being a retired army officer, PMB is my commanding officer and the general leader of my party, the APC, therefore I will do anything in my capacity as an interested party to support the President for his noble repositioning of Our beloved country Nigeria. "Consequently, anyone who does not support the administration of President Muhammadu Buhari is an enemy of the nation," Sule said.